In honor of GKids re-releasing the Studio Ghibli films on Blu-Ray, Adam is writing a ongoing series highlighting some of the best Studio Ghibli films about Young Females. The series begins with Hayao Miyazaki’s My Neighbor Totoro. The power of My Neighbor Totoro is the film allows kids to be kids. The film is unfettered by plot mechanics that would liter this story if it were not written and directed by Hayao Miyazaki. The world was not prepared for My Neighbor Totoro and the gentle natured narrative of two sisters dealing with their mother’s illness with the aid of woodland creatures. The film was a failure upon initial release and only upon debuting on Japanese National TV it began to grow in esteem. Now, thirty years later Totoro is an icon revered by cinephiles and children around the world. Plush toys, ceramic lamps, posters all adorning the visage of the fluffy cat like spirit have sprouted forth like the acorns that Satsuki and Mei plant. Beyond the amazing design of Totoro, Cat Bus and the other woodland sprites what makes this such an enduring tale? Miyazaki’s beautiful narrative never panders nor does it rely on histrionics of plot devices. My Neighbor Totoro rather sees the world and its story through its primary character, Satsuki, the eldest sister. Satsuki does not have super powers, nor is she “the chosen one” or any other paradigm on the Joseph Campbell scale of heroines. Rather, Satsuki is a smart, inquisitive, good hearted young lady that watches over her younger sister. Above all else, she is a normal child. That very fact is where Totoro ultimately draws its power from. Everything that occurs in the film is drawn from everyday life. The mundane is made fanatical. The opening fifteen minutes is simply a family moving into a new home in the country. In Miyazaki’s hands this becomes an adventure in of itself. The girls search through their surroundings excited by nature and the sights. The director holds back on giving an inkling of the supernatural as long as possible and it’s only until after they’ve explored everything that the wood sprites appear. This moment with the foundation already laid makes the fantastical wonderous. Satsuki and Mei by their very nature accept these spirits as real and harmless. They are infatuated by them, instantly making friends with them. The film is beautiful in the way that it simply shows these spirits and the rules they must adhere to. Never telling us with clunky plot exposition. My Neighbor Totoro has no plot exposition; rather Miyazaki creates a visual exposition that’s more akin to silent film than anything else. There is a whimsy throughout the film that recalls the imagination of Jean Cocteau. Miyazaki’s film never veers into maudlin territory though it deals with the illness of Satsuki and Mei’s mother. The film is skilled at showing us the frustrations that these girls both feel about their mother’s illness and how this affects them both. The director never creates perfect humans but rather fallible ones. These moments and characters allows for the fantasy aspects more meaning. Far too often in fantasy films, it’s the spirit that saves the human guiding them to some sort of ideal. Here it is quite different. It’s through work and acts of kindness towards the spirits do these girls learn (as we do) about this world writ large. The first moment where Satsuki meets Totoro is an example of this. The girls have been waiting for their father to return from the hospital. Rain and cold has drenched both girls. Out of nowhere, Totoro appears. The girls and Totoro inspect one another. It is a simple act of kindness though tired and cold towards Totoro that earns his trust. It also earns them it’s (as we are never told Totoro is male or female) kindness and kinship. Rather than it being a moment of relief for the girls, the scene shows them helping Totoro. Miyazaki shows us these girls above all else are amazing because they choose to help Totoro. In return Totoro helps them when in need of it most. The film may have Totoro in its title but it never loses sight of its heroines; Satsuki and Mei. The sisterhood on display is one of the most elegantly written and performed ever. Satsuki and Mei love each other but also are cantankerous, frustrating, angry, sad… everything children are. That is the most powerful aspect of My Neighbor Totoro; it allows girls to be girls and asking them to be nothing more than that, as being a girl is just as powerful as being a super hero. GKids/Shout Factory has received a brand new remaster from Studio Ghibli or have tweaked the masters that Disney was provided for their Blu-Rays. This transfer is far superior to the Disney one as it’s sharper and more vibrant. They have not changed anything significantly. Everything looks a bit cleaner and clearer. It would only be a side by side comparison where you’ll note the differences. That being said the transfer is simply gorgeous. Having seen the film in all iterations of Home Video since 1989 in the US this is by far the best Home Video Presentation. Bravo to GKids for the care and time that went into these transfers. NOTE: Included are both the Japanese and US Dubs of the film with optional Subtitles. Everything was basically ported over from the Disney versions with the exception of the John Lasster based interviews. The Locations of Totoro is by far the best featurette which is a documentary about the locations used to inspire Miyazaki’s design of the film. It also serves as a discussion about his love of nature and conservation. The features Creating My Neighbor Totoro, Creating the Characters, The Totoro Experience and Producer’s Perspective: Creating Ghibli are all culled from the same longer documentary but here are divided into individual featurettes. These give a look behind the scenes and give context to Totoro as a film, culturally and for Miyazaki and Ghibli itself. Fledgingly animators take note that the entirety of the film has been presented in Story Board format. Further making this special, these are Miyazaki’s own hand drawn storyboards. I have watched the film with this feature toggling back and forth between the completed film and story boards. It presents a fascinating portrait of the animation process and the differences in the frame from the moment that Miyazaki draws it to its completed form. I mention the 8 page booklet as it’s a beautiful introduction by Miyazaki himself. My Neighbor Totoro is a classic. There shouldn’t be any reason you shouldn’t own this film especially with this rerelease Blu-Ray. Highest possible recommendations!!! 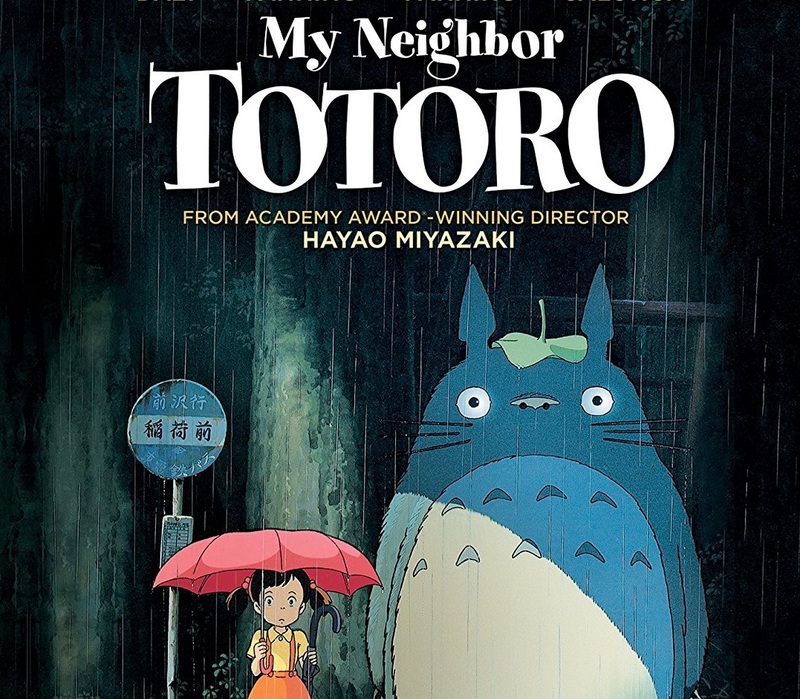 My Neighbor Totoro is available now on Blu-Ray!